People like to tell you that running is a cheap sport at the ground level. After all, you only need shoes and shorts, right? I mean, sure. You can tell yourself that. But once you fall in love with it (because trust me, that will happen), you’re going to want to upgrade your game. One of the first items of gear you’ll likely purchase is a GPS running watch so that you can track how far and how fast you are going on your daily jaunts. I’ve outlined five of my favorites below, but keep one thing in mind: don’t bite off more than you can chew. Think long and hard about what you actually need in a watch rather than the glitz and glamour of the flashiest new tech items. Depending on your personal needs, simpler and easier may be better. We’re launching out of the gates with the priciest watch on the list. Garmin is well-known in the GPS world and the Fenix 5 Plus leads the way with a bevy of features. For starters, there are modes for both regular running and trail running (along with hiking, cycling, and any other sport you may consider…). If you’re an experienced runner who wants to track VO2 max, recovery times, and training loads, the Fenix is your jam. Moreover, if you are into topo maps, this watch allows you to upload GPX routes to follow. And did we mention that it’s compatible with Spotify?! 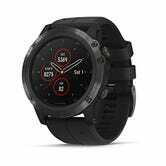 Of course, luxury comes at a price: the Fenix 5 Plus is more than four times pricier than the Garmin Forerunner 35 (below). Not everyone can spend their weekly salary on a running watch, and nor should they. 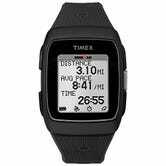 If you are new to running and want a basic watch to help you ease into a routine, consider the Timex Ironman GPS. 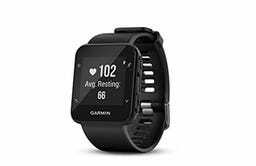 At about $100, it’s affordable and it offers the necessities: swim, bike, and run metrics, pace, distance, and splits. It comes with an intuitive display and has a few niceties like an “out and back” feature that tells you when it’s time to turn around (as if I wasn’t already counting the minutes). 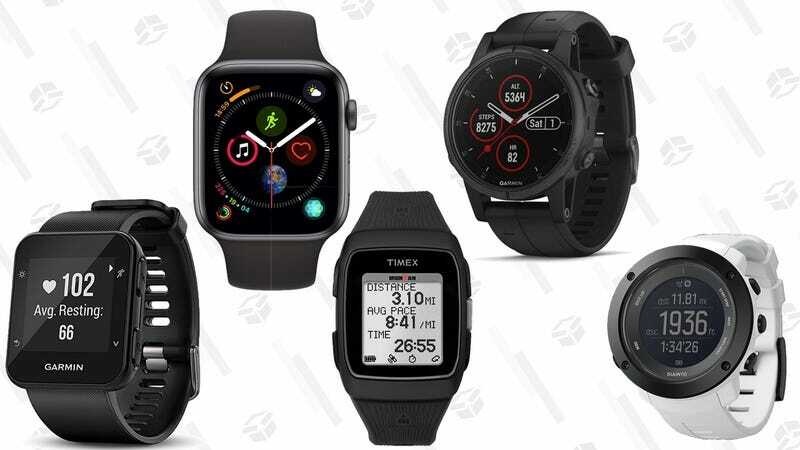 Battery life is around 12 hours, but this bargain-level price comes with one caveat: no heart rate monitor. If you’re a fan of Apple, you will be hard-pressed to beat the Apple Watch Series 4 series since it’s essentially a one-stop-shop for all things fitness. Sure, the watch only covers the basics: distance, time, pace, and heart rate. But, the GPS immediately locks on, so there’s no standing at the end of your driveway with your arm in the air, waiting for a signal (because yes, we’ve all been there). It syncs with third-party apps like Strava if that’s your kind of party, and Apple Music runs seamlessly via downloaded playlists or streaming radio on an LTE service plan. Plus, if you’re like me and enjoy tracking the completion of your exercise rings each day, your run automatically counts towards those move points. Yeah, buddy. This bulky wrist piece of wrist jewelry is great for trail warriors who really need to know more about the peaks and valleys of their time on trail. With some of the best GPS sensors I’ve ever tested, the Suunto Ambit3 Vertical features awesome navigational skills that can be tough to find once you get deeper into the mountains. The watch includes an altimeter, compass, barometer, GPS, and even a thermometer which is great if you’re the type of runner who hits the dirt in changing weather. Thanks to a monochrome display, battery life is top shelf. Ding: If you are interested in your heart rate, you will need to wear an additional strap. Unlike the Fenix 5 Plus above, the Forerunner 35 clocks in at just over $100, which is quite reasonable in the world of wearable tech. But, affordability doesn’t mean low quality in this case. In addition to the standard running features, it tracks your step count all day, as well as your heart rate via the wrist. It’s stylish enough for daily wear (although I think the Apple Watch looks nicer), includes vibration alerts for notifications, and the easy-to-view screen works well in light and dark conditions, which is ideal since the watch doubles as an activity tracker. But, impatient types be warned: the Forerunner 35 sometimes struggles to lock onto GPS signals, in my experience.